The Presiding Bishop for the Episcopal Church serves for a single nine-year term. There’s disagreement on what her job currently is, and much debate on what it should be. She is not infallible like a pope, and can’t veto like a president. In some ways she is more of a spiritual advisor and figurehead, in other ways she is the CEO and chief administrator. Today was the first time the House of Deputies was given a chance to meet and learn about the candidates prior to the vote in the House of Bishops. There were bios and intro videos released ahead of time, and today we saw additional “homemade” videos, heard intro speeches, and listened to the candidates answer questions – A LOT of questions. The questions were submitted by church members ahead of time and separated out into categories such as structure, theology, LGBT issues, etc. The bishops took turns pulling questions out of a bowl and giving short, off-the-cuff answers. Over the course of three hours, we got to know a bit more about the candidates and how they might lead the church. 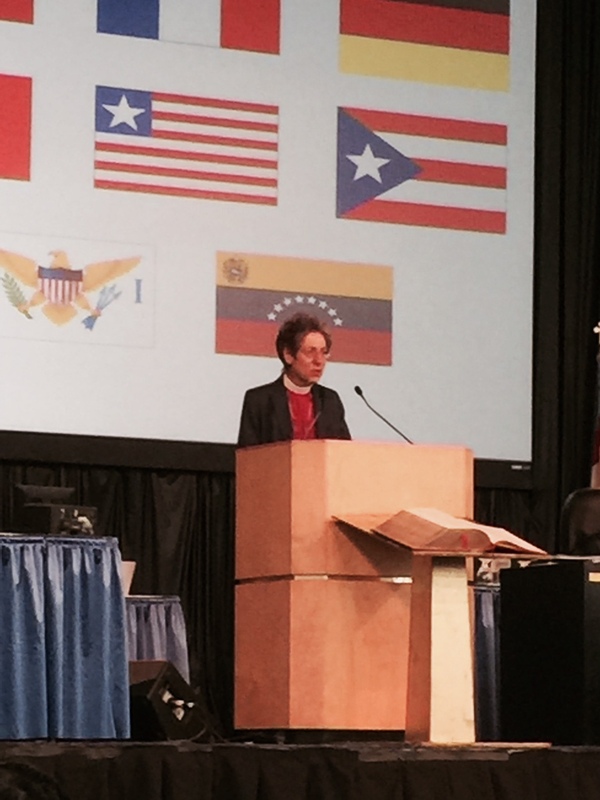 The environment surrounding the election of a Presiding Bishop is delicate and strange. On one side it’s a typical election where candidates are nominated and must prove their worth to a group of voters who then decide who should get the job. On the other hand it’s supposed to be a calling, not a career move. This subtlety is reflected in the language we use. The nominees aren’t “running” for Presiding Bishop, they are standing for election. They are making themselves willing and available, not vying for the job. This tension was certainly present in the opening speeches and many of the answers. I couldn’t help but think of the Miss America competition. The questions ranged from the simple and easy (“How has your prayer life changed?”) to the nearly impossible (“How do you feel about divestment in Israeli companies?”). Just like with Miss America, the candidates must craft an answer that means all things to all people. Nothing too upsetting, nothing too generic. To their credit, the nominees were a lot more willing to jump into specifics than most beauty contestants, but then again their audience is a bit more forgiving and their answers aren’t on YouTube. After about an hour I leaned over to the deputy next to me and said, “You know if they weren’t all trying to become Presiding Bishop, I might really enjoy this.” If they felt a bit freer with their answers and if the questions were a bit more open, the basic activity would have been really wonderful. Imagine if part of every General Convention involved us putting a small group of well-spoken bishops and other leaders on the stage and asking them to reflect on the issues surrounding the church. How much might we learn – and how much might we change – if they speak and we listen and no one has an agenda? While I think the session was well organized and I appreciate all the work that went in to getting the House of Deputies more involved in the process, I couldn’t help but ask, “What am I doing here?” The laws of the church dictate that it is the House of Bishops that elects their presider. All the House of Deputies does is confirm the election (a good and reasonable guard against a totalitarian takeover). There are plenty who think this should be changed, but I’m not one of them. The House of Bishops meets way more often, they are a smaller and more intimate body, and they have consistency of membership. The House of Deputies is huge, meets once every three years, and is about 40%-50% brand new people. We don’t know these bishops like they know each other, and we certainly aren’t any more qualified than they are to make a decision based on available information. So unless I suspect foul play, I see no reason not to trust their judgement and confirm whomever they call. If we can’t trust them enough for that, why did we elect them in the first place? Before today, all I knew was the four names and I felt generally ambivalent about all of them. I was confident that the committee we elected was able to find four candidates that would all do a fine job. I didn’t really care who won. Now I know a bit more about each of them, and while I wasn’t really trying, I can’t help but have a favorite. But I still don’t have a vote. So all I have gained is the possibility to be disappointed when the guy I want isn’t picked. I worry what will happen if we acquiesce to present paranoia and make the change suggested by TREC to have the Presiding Bishop elected by both houses. I worry that the politicking will go up, that we will have to suffer through actual campaigns, and that the job will always end up going to the person who wants it the most (which is almost never the best person for a leadership role). The vote happens on Saturday in a closed session of the House of Bishops. No white smoke will go up. Instead a simple a message will be sent to the House of Deputies and a bit of (possibly unnecessary) bureaucratic process will occur before the vote comes before the house. And I’m voting yes. I don’t normally decide my votes ahead of time, but unless some strange and terrible thing is revealed about the candidates between now and then, I’m voting to confirm whichever person they choose. And why shouldn’t I? I respect and trust the bishops. If I didn’t, I wouldn’t still be in a church named after them. This entry was posted in Salt Lake City 2015 Preshow and tagged elections, Presiding Bishop. I have officially arrived at the Anaheim Hilton! I’m not used to having a hotel room all to myself for so long, so just unpacking was pretty exciting. Still a little unnerved that when I call the front desk from my room they answer with, “Hello Miss Hamilton,” but I think it’s just something I’ll have to get used to. We had our first meeting as a deputation in the group suite. Not much to report except that we’ll be meeting there everyday 20 minutes after we get out of legislative session, and that more people like root beer than you might think. I’ve been doing more reading over the last few days, studying up on Inter-religious Relations, going over the budget, reviewing some GC history. You can be assured that if anything starts making waves, you’ll hear about it here. One subject has come up several times in the last couple weeks that I thought deserved attention. The clergy and lay people elected to General Convention are not delegates or representatives, they are deputies. This is a very important distinction, as deputies vote by conscience, not based on the views of those they are acting on behalf of. This is a rich and important part of convention history, but more realistically, it is the only ethical and practical way to hold this kind of event. First of all, consider the feasibility of knowing how an entire diocese feels on the issues. There are around 32,000 people in my own diocese. There were 188 “A” Resolutions to consider in the Blue Book, and today I received 11 “B” Resolutions, 77 “C” Resolutions, and 25 “D” Resolutions, as well as a few changes to the original “A” Resolutions. The fact is that a majority of Episcopalians are not informed enough about the myriad of issues to have opinions on it all. Even if they did, how would they communicate those feelings to the members of the deputation? Second, attempting to represent a group of people locks you into a way of thinking and a way of voting. Resolutions, ideas, and issues do not leave convention the same way they arrive. Stories are heard, opinions voiced, and amendments made. Something that your diocese would have supported before may change so much on the convention floor that the original message has vanished. While General Convention is a legislative body, we are still people of God, and we must be able to vote from the heart and conscience, or we are blocking out the holy spirit. Debate is healthy. Changing one’s mind is healthy. Attempting to speak for the thousands of people who elected the hundreds of people who elected me is not an effective way to approach General Convention. It is hard for some people to hear, because in a way I have no accountability with my own diocese. I make my own decisions here, regardless of the feelings and beliefs held by those who put me here. But it is the most effective, efficient, and ethical way to have eleven hundred people make decisions for two million, and I am very happy to have the freedom to change my mind. This entry was posted in Anaheim 2009 Blog and tagged deputy, elections, GC History, root beer.